The enemy is downtime, and PushToTest is the solution. 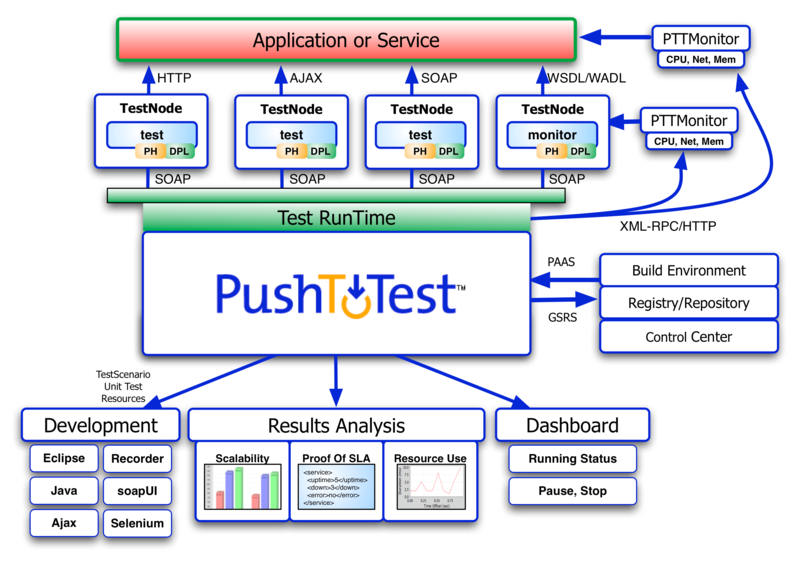 PushToTest is the open-source platform for software developers, QA groups, and IT management to test, optimize, monitor, and govern information systems. At any given time new software needs installation, existing application software modules and database software needs to be patched, application software and databases need to be tuned and optimized, and the root-causes of crashes, downtime, and performance bottlenecks need to be analyzed and remediated quickly. The PushToTest test runtime environment automatically turns these same functional tests into load tests, scalability and performance tests, regression tests, and service monitors for QA technicians, IT operations managers, and CIOs. The PushToTest tests and service monitors integrate into your service registry/repository management systems for end-to-end IT optimization and business service management. Application testing – Avoid Downtime, Quality Patches, Updates, Hardware Changes. super ,,smashing,, great,, thanks for the excellent information you have provided..